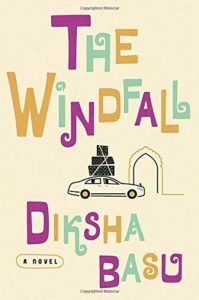 The Windfall by Diksha Basu is about the Jhas, a middle-aged Indian couple in Delhi who move from their middle-class apartment and neighborhood to a fancy new house when Mr. Jha sells his website for a lot of money. They are sad to leave their old friends behind and experience some growing pains as they get used to a bigger house and being able to buy whatever they want, but Mr. Jha in particular is eager to show off his wealth to his new neighbors. Meanwhile, their son Rupak is failing out of graduate school in America and hiding his American girlfriend from his parents. That’s pretty much the whole book, other than a subplot about a young widow (neighbor to the Jhas) who finds love with the brother of the Jhas’ new neighbors. So, I *really* didn’t like The Windfall. The characters were vapid and materialistic, caring only about appearances and keeping up with the rich neighbors and impressing the old ones. They don’t talk about anything of substance, ever. There is one time when Mr. Jha seems to question the purpose of life to Mrs. Jha, but that lasts about 2 sentences and is over before she can even respond. Rupak is aimless, inconsiderate and lazy, and when he gets booted from Ithaca College for smoking dope, his parents welcome him back to India and seem almost proud that he’s back living on their dime, because it shows that they are rich enough to support him. He at least seems a little more introspective than his parents, who just bicker and whine at each other. There was so much potential here – The Windfall could have been funny, incisive, biting, wry, or even just plain interesting – and it was none of those things. There was no tension or suspense, and one out-of-character meltdown right at the end of the book seemed totally implausible and out of place, rather than serving as some sort of dramatic peak. I didn’t even get a good sense of Delhi from this book – just the fancy new neighborhood of Gurgaon and the Jha’s new sofa. I listened to The Windfall on audio. Narration by Soneela Nankani was fine – she did different accents for different characters, particularly people of different social levels – but I wonder if her narration exacerbated my issues with the book. Even she seemed to be irritated by the characters. She probably could have toned the performance down a little bit, just to make it all seem a little less absurd, but I am not sure it would have redeemed the book for me. Posted on August 29, 2017 by gayle. This entry was posted in Audiobooks, Fiction and tagged audiobook, diksha basu, the windfall. Bookmark the permalink.